Perspective view of the axis of the East Pacific Rise from 9°45'N to 9°58'N looking to the north with a close up of the region where the 1991 and 2006 volcanic eruptions were focussed. Image on left is created from bathymetry data from White et al., G-Cubed 2006 (30 m grid interval). 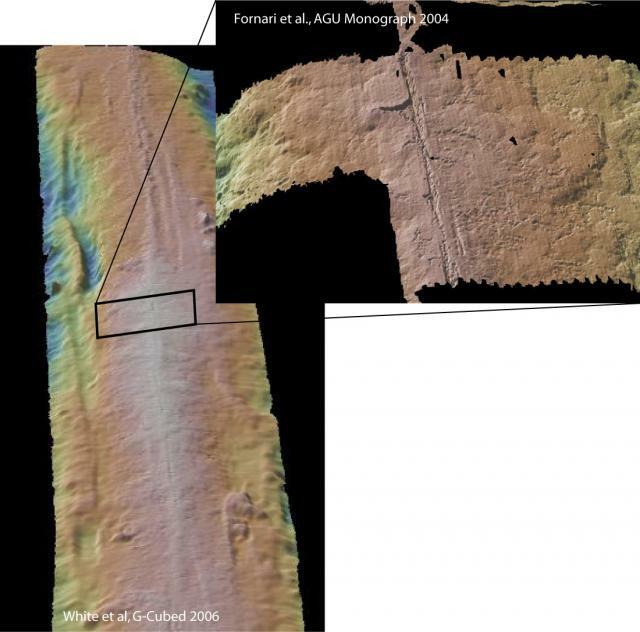 Close up image on right is created from ultra high resolution bathymetry data gridded at ~5 meters collected with the Autonomous Underwater Vehicle ABE (Fornari et al., 2004). Image made using GeoMapApp.